Busy days and horrific traffic have kept me from posting the last couple of days. Yesterday, for example, what was supposed to be about a 45 minute ride back to the boat after a canal tour here in St. Petersburg took over 3 1/2 hours. We had the same problem the other day after a city bus tour. And, the ironic thing, the streets where traffic just crawls could add a lane simply by eliminating the free parking curbside. It would be like if they allowed parking on the FDR or Westside Highway. Okay, the cannon that was never fired. 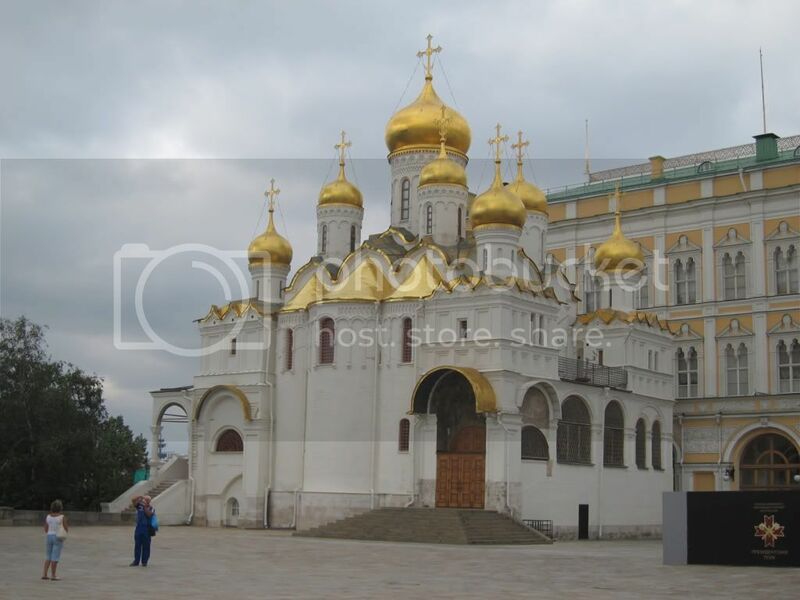 It was created in 1586 under the order of Tsar Feodor Ioannovich, the sovereign ruler of all of Russia at the time. It has a caliber of 890 mm and is, supposedly, the world's largest cannon. The cannon’s surface is decorated with cast iron figured friezes, memorial inscriptions and an equestrian image of Tsar Feodor Ioannovich. 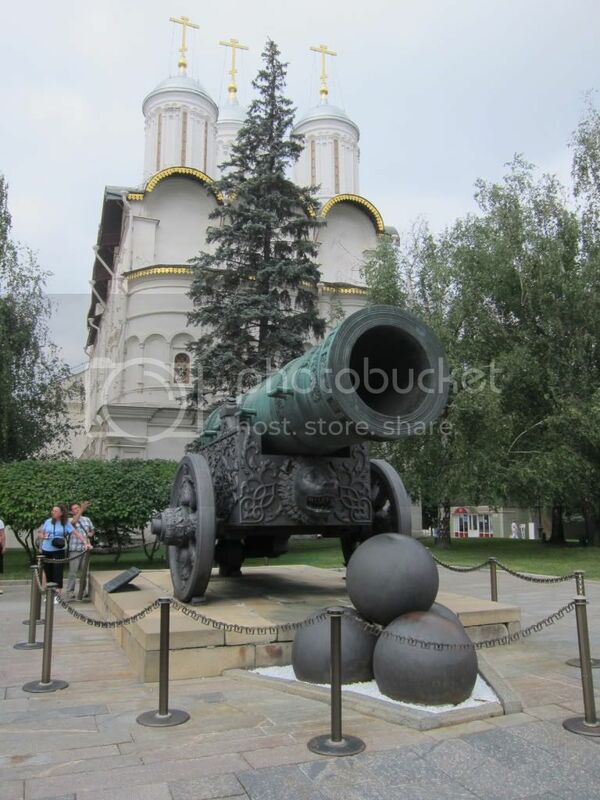 In 1835 the cannon was fixed on the carriage specially cast for it at the Berdt’s factory in St. Petersburg. Four hollow decorative cannonballs were made at the same time. Ir was never intended to be fired and was made for decorative purposes only. Now, the bell that was never rung is a different story. This bell was intended to be rung but it was not to be. 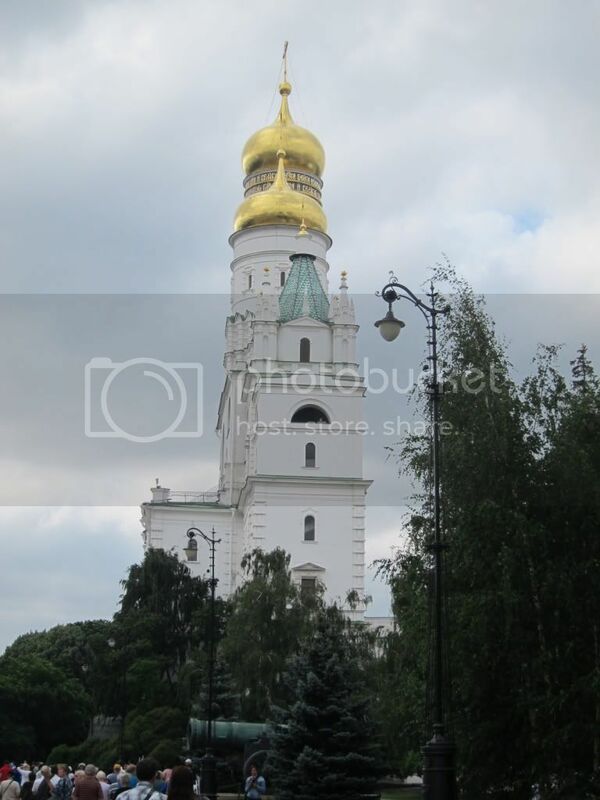 The Tsar Bell was commissioned by Empress Anna, niece of Peter the Great, in 1737. At that time most of the buildings in the Moscow Kremin were made of wood and while the bell was still in its casting pit a fire broke out in the building above it. Water used to put out the fire seeped into the pit where the bell was still being cast and a huge piece, 11.5 tons, cracked off. The bell remained in the casting pit for a hundred years before it was removed and put on display next to the Ivan the Great Bell Tower where, I believe, it was intended to be hung. The bell weighs 216 tons, is about 20 feet tall and has about the same diameter. It is approximately three times larger than the next largest bell, the tenor bell at Liverpool Cathedral. 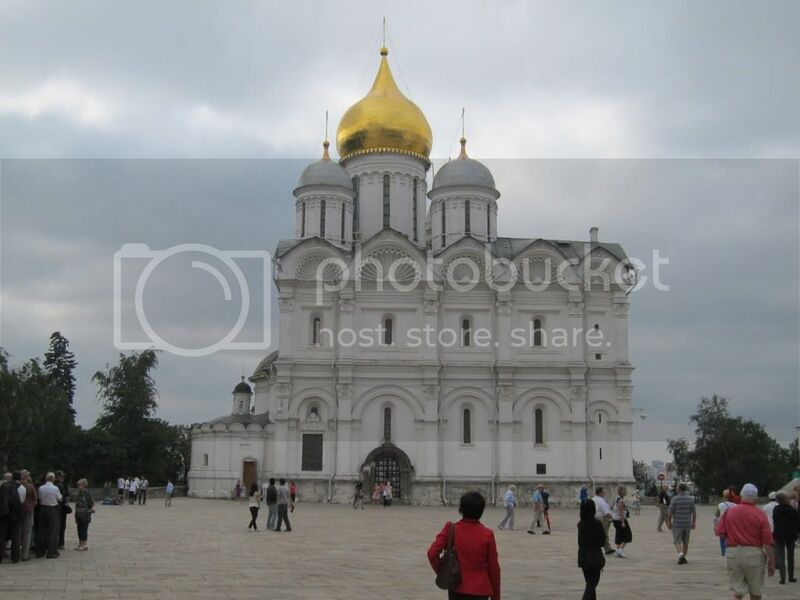 Moscow, like Rome, is built on seven hills and the Kremlin originally was a walled city built on one of the hills with a command of the nearby river and surrounding area. It was, in essence, a fortified castle. 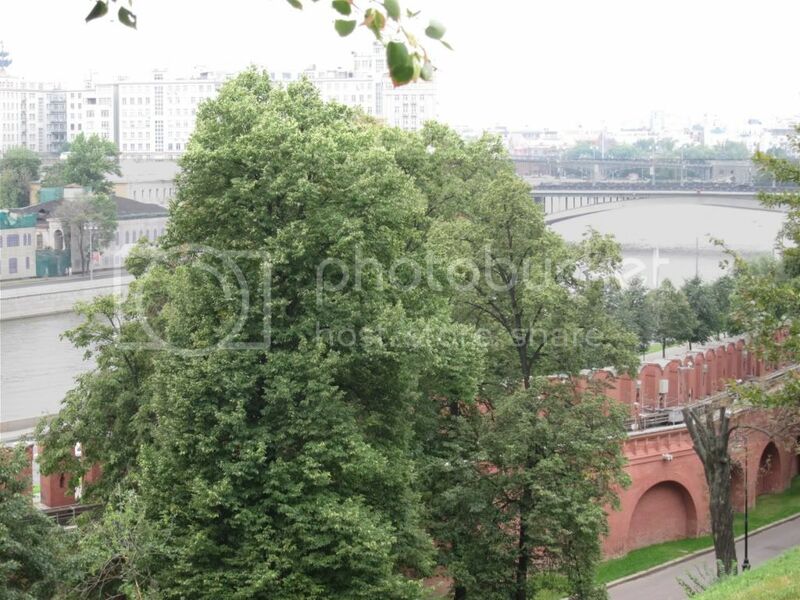 Well, that is about it for the Moscow Kremlin. Well worth the visit and gave me an entirely new perspective on just what the Kremlin is all about. Okay, here is a Russian joke. And the mere fact that you can openly tell such a joke tells you something about how Russia has changed. What is the tallest building in Russia? It is the KGB headquarters, because from the basement you can see Siberia. And it wasn't too long ago that if you were ever hauled to that basement Siberia was probably your next stop. Or the grave. You can sense how recently the repressive policies of a police state were eliminated. If you talk to younger people they are very open and helpful but if you approach an older person they often just turn away as if they are afraid to talk to you. 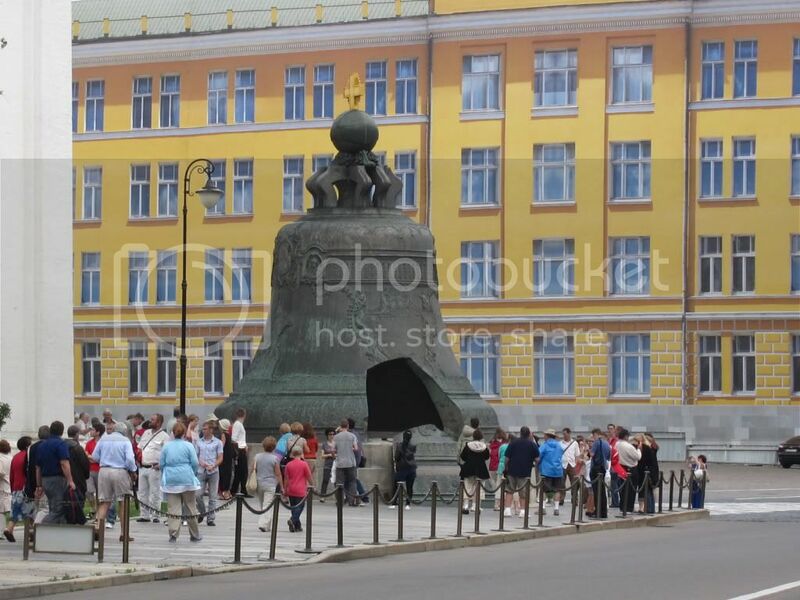 A side note, the only statue or memorial to Stalin is in his home town, a relatively small village. All others have been removed. Well, this was a bit of a short post but it will have to do for now. We are going to be heading out to catch our plane soon for the long flight home. I will be posting more about our trip after I return, though. I am going to miss having lox and sparking wine for breakfast every day. We are docked in St. Petersburg and I have some time before we head out to our tour of the Hermitage. Decent internet connection, too. Before the Kremlin, I would like to clear up a couple of misconceptions people seem to have about Russia. First, someone was telling me how it is still a socialistic country with prohibitively high tax rates. Nothing could be further from the truth, those days are long gone. The tax rate on most individual income is 13% and the corporate tax rate is 20%, lower than the corporate tax rate in the United States. The tax on dividend income is 9%. People can own their own homes and land or apartments, farms, businesses, whatever, just like in the United States. Most children go to school within walking distance of where they live unless their parents want to send them to a school with a specialized subject matter. There is eleven years of basic education, but children don't start school until they are six or seven years old so there is no kindergarten or pre-school. Children are expected to be able to read by the time they start school and it is the parents responsibility to teach them. After your basic education there are competitive exams and those who do well get full tuition at government Universities. Those who don't do as well can attend private colleges if they can afford the tuition. People in the medical profession are required to work half of the time in government hospitals and medical facilities but are free to work the rest of the time at private hospitals. Generally the government hospitals have the more state-of-the-art equipment and are similar to our research hospitals. This is also where doctors and nurses earn advanced professional designations. Medical care is free at the government facilities but you can chose to pay more to go to a private facility where the care is more personalized. They don't have emergency rooms, as such. If you are in need of medical attention a doctor will come to your house and, based upon the situation, either treat you there or arrange for an ambulance to take you to a hospital. These visits are free. I just wanted to clear up a few misconceptions that we seem to have about Russia. It might not be where you would want to live, but it is not nearly as bad as people seem to make it out to be. Their worst times seem to be behind them, although life during the time of Gorbachev and Yeltsen was no bed of roses with debilitating inflation, people losing most of their savings and struggling to survive. Interestingly, when Gorbachev ran for re-election he received less than 1% of the vote and is generally reviled these days. He now spends most of his time abroad giving lectures. 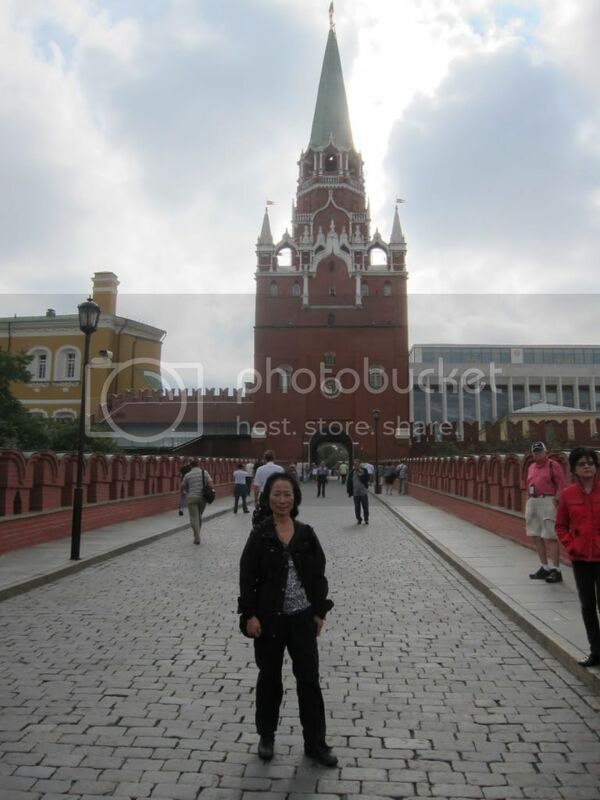 Okay, on to the Kremlin. 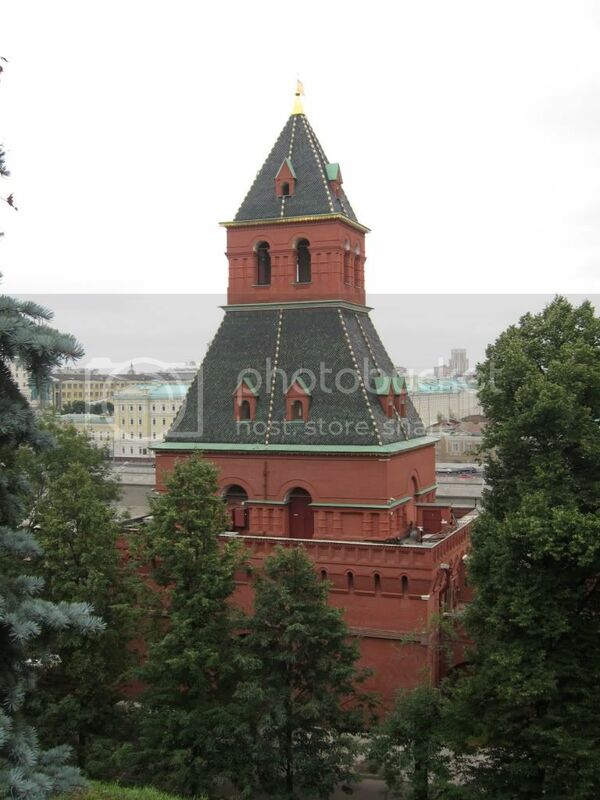 As I mentioned, the word "kremlin" means castle (or fortress) and there are many of them in Russia. 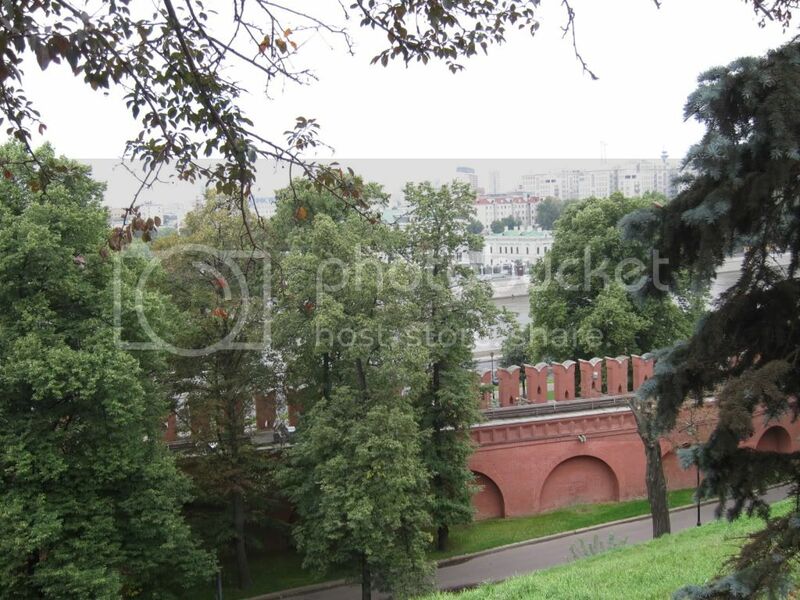 The one in Moscow started out as a walled fortress and was the city of Moscow. 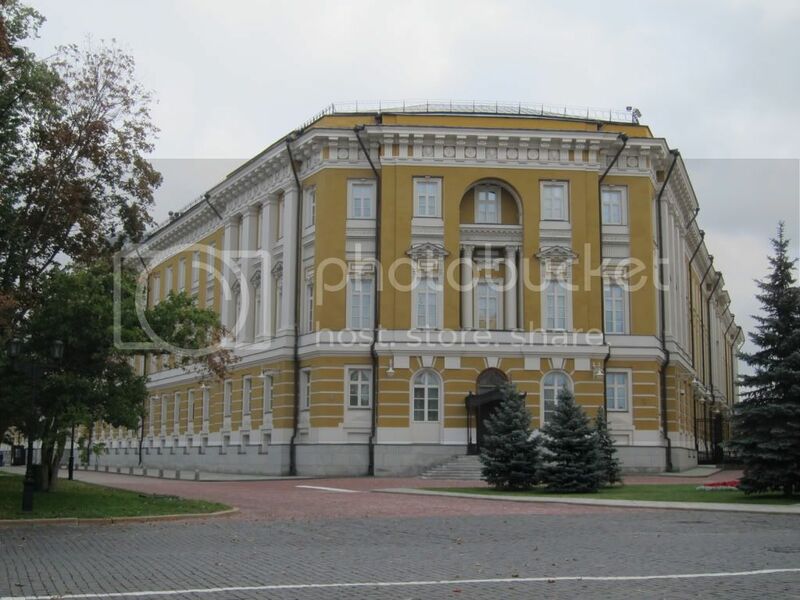 The first written records go back to 1147 and it was a Prince Yuri who is considered to be the city's founder. In addition to the old buildings there are some newer ones. The one that is the most jarringly out of place looking one is this concert hall. This hall was built during the time of Nikita Khrushchev and, for a time, cost the Kremlin it UNESCO World Heritage Site designation. I think they got it back, though. Artists from all over the world have performed here. 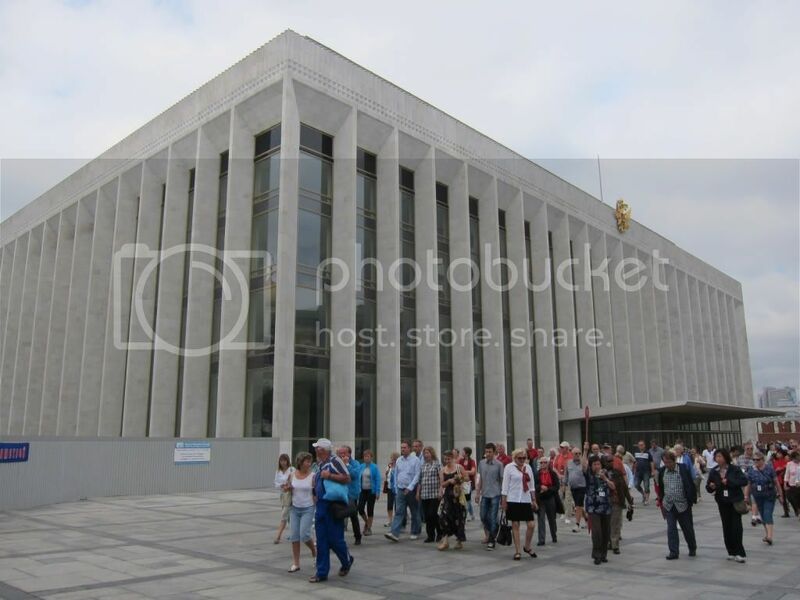 I see that Twisted Sister is going to be performing in Moscow, but not here, because the hall is being renovated. But what a juxtaposition that would be, Twisted Sister playing the Kremlin. Potemkin, you may remember, wrote a story about a municipality in Russia that constructed just the facades of villages so that when some Czar or another rode through he would think that he was riding through a prosperous ares. Or something like that. Anyway, that picture above is just a painting on covering over scaffolding surrounding a building that is undergoing restoration. The building does look like a smaller version of the painting, however. And, because this was a walled city, there were many churches inside the walls. Where has the time gone? This will have to be a two parter because I need to leave for my tour, but first a picture of a cannon that was never fired. I will tell you more about it as well as about a bell that was never rung when I post again, either later today or, more probably, tomorrow.